Our Maine heritage is integral to our identity as a company. 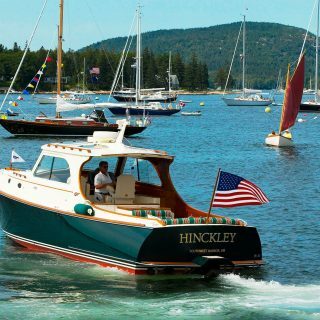 Founded in 1928 in the Mount Desert Island town of Southwest Harbor, The Hinckley Company still operates and constructs our yachts locally. The surrounding area boasts some of the most stunning vistas in the country, thanks in large part to Acadia National Park, now approaching its 100 year anniversary! Not only is Acadia National Park in our backyard, it was the first National Park founded east of the Mississippi River. The Park is home to many ecological gems, such as the dramatic 110 foot Otter Cliff and Cadillac Mountain, the tallest peak on the eastern seaboard. Visitors flock to the park for varied outdoor activities such as cycling, climbing, bird watching, and of course, boating. This treasured spot deserves to be conserved for the enjoyment of both Mainers and vacationers alike. Safeguarding the landscape and native wildlife is made possible with the participation of community members and organizations, the same establishments who have partnered with the Park to help commemorate this milestone. As stated on the Centennial Celebration’s website, “More than one hundred organizations, businesses, and individuals from Acadia’s surrounding communities and beyond that have joined together to create a community-based and world-welcoming celebration.” All of us at The Hinckley Company are happy to count ourselves among the sponsors of the celebration. Events throughout the summer of 2016, such as the dedication of the Sieur de Monts Nature Center and the Somes Sound Windjammer Parade, will help to mark the occasion. We invite all Hinckley owners and friends to join us in the yearlong festivities to advance the conservation goals of Acadia National Park.